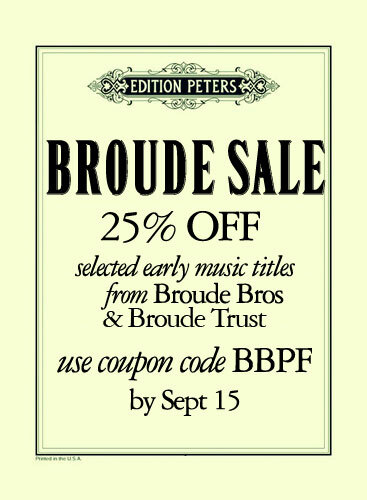 25% Off Early Music From Broude! Broude publications in early music have long valued for their editorial sophistication and for the fine quality of their production. Many of these publications are now offered at a discount of 25%, a substantial savings: View the complete list below. Performers’ Facsimiles—Full-size, clearly printed facsimiles of more than 300 works from the sixteenth to the nineteenth centuries. Included are works for solo instrument, for small ensemble, and for full orchestra, representing well-known composers—J S Bach, Beethoven, François Couperin, Handel, and Vivaldi—as well as less frequently encountered masters. Critical Facsimiles®—Edited facsimiles, most with texts from the Broude Trust’s critical editions. Performing Extracts—Texts offprinted from the Broude Trust’s Buxtehude, Forqueray, Jacquet de La Guerre, and Marais editions. Art of the Keyboard—Music for harpsichord, clavichord and organ in newly edited modern editions. Principal volumes have historical introductions and full critical apparatus; offprints have the same musical texts as principal volumes but have abbreviated introductions and no critical apparatus. It is now a year since C.F. Peters began distributing the publications of Broude Brothers and the Broude Trust to the music trade. To celebrate this relationship, Broude and Peters are offering a joint promotion of Broude’s early music publications. Early music is an area in which the Broude name is especially well known. The Broude Trust’s critical editions are among the finest in the world, and the Broude facsimiles series are valued by performers, researchers, and librarians. The present promotion, which lasts until September 15th, 2018, includes Broude facsimiles and practical editions. It begins early enough (now) for summer-workshop attendees, and it lasts long enough (September 15th) for those who plan ahead to do some early holiday shopping. The discount on the publications offered in this sale is extended to the trade, so discounted copies should be available from your favorite dealer. The titles included in the sale are those on the list below; the special sale discounts do not extend to any titles not on the list. ALBRECHTSBERGER - Douze Fugues, Oeuvre I. PF 172. BABELL - 12 Solos. Op. Posth., Part 1. PF 186. BACH, J S - Clavier Ubung, Teil I.
BILLINGTON, E. - 6 Progressive Lessons. PF 194. BON - 6 Sonate per il cembalo. PF 152. BUXTEHUDE - VII Sonates, Op 1. CF 2. BUXTEHUDE - VII Sonates, Op 2. CF 3. GREENE - Six Overtures. PF 161. GREENE - Twelve Voluntaries. PF 192. GUERINI - Six Solos for Violoncello, Op IX. CF 8. KRIEGER - Anmuthige Clavier-Ubung. PF 162. LUBECK - Clavier Ubung. CF 5. MARAIS - Pieces en trio. CF 4. MUFFAT, GEORG - Apparatus Music-Organisticus. PF 181. PETRUCCI - Harmonice Musices Odhecaton A. CF 7. SCARLATTI, A - VI Concerti. PF 173. SCHUBERT - Grand Quintuor [The Trout]. PF 160. SIMPSON - The Division-violist. PF 215. TARTINI - L'arte del arco. PF 168. TELEMANN - Nouv Quatuors (Paris Qts 7-12). PF 224. TELEMANN - Six Quatuors (Paris Qts 1-6). PF 223. WEELKES - Madrigals for 5. and 6. Voices. PF 190. WEIDEMAN et al - Compleat Instructions for Fife. PF 158.